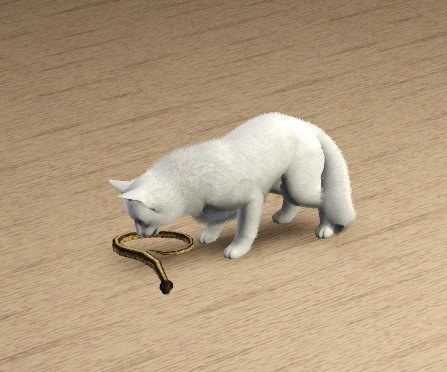 When I got the Pets EP and saw that cats could go hunting I was all excited like "Oh, awesome, so I don't have to pay for her food"
......well it turned out that cats in the Sims 3 are either real gluttons or that the huge fish in the lakes were actually made of paper or plastic because the hunger gain was close to non existent. After asking all-knowing-google I still couldn't find a mod to change that (I'm sorry if there is one, but I only found a post here that asked for such a mod, but without any productive answers,funny ones though) so I tried it myself. The motive bars range from -100 to 100 and it turned out, the gain from minor pets was set to mere 25. Unfortunately that value is for everything, from cockroach to mini python, the game does not differentiate and since I actually have no Idea about modding I can't change that either. What I could change was the "25"
So, what this mod does? It increases that very value. you may want to choose your flavor according to your pets preferences, lets be honest having a beetle almost fill up your hungerbar would be just as ridiculous as having a huge shark fill only 25 points (let alone the fact that a cat can actually catch those sharks). Like I said I have no Idea how to specialize that value, if you do please give it a try I would most certainly be grateful!